Nevertheless, we figured out a way to build with it. We just pile up as much snow as we can and then dig out a shape. 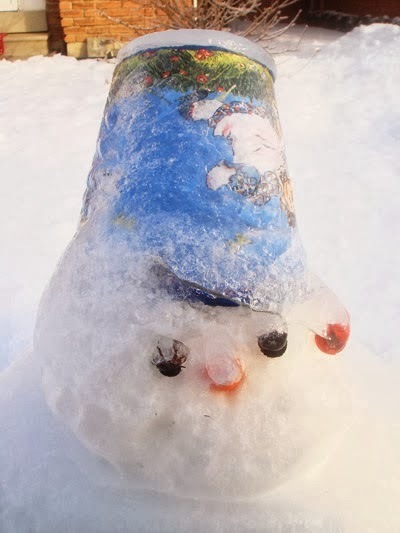 I built a snowman this way. Granted, it turned out to be mostly a pyramid, rather than a couple of spheres piled on one another, but it was a snowman! We added a small carrot, eyes, mouth and a small bucket for the hat. We made a couple of dinosaurs the same way. 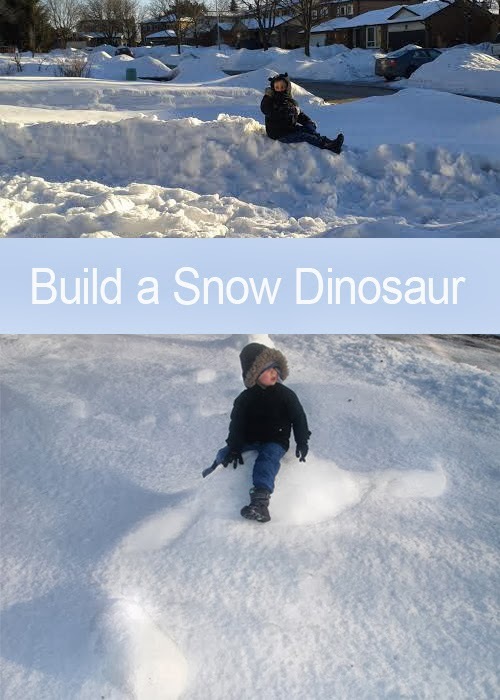 We just make this long mound of snow, shape it in a sleeping dinosaur, with a long neck and a long tail. One of these dinosaurs got covered with ice after the ice storm back in December, and it kept its shape for a while. Santino got to ride it a few times until it got covered with more snow. Another dinosaur that we made recently was destroyed by Santino the moment after we finished building it. He yelled that it was a big Godzilla and started throwing snowballs in it. (Not the real snowballs, rather chunks of clumped up snow). Then he "finished it off" by kicking it with his feet and then his shovel. I asked Santino to pose for me by sitting on this Godzilla, so you can see the "remains" now. My point is: another dinosaur activity! And your kiddo can even ride it! If you have no snow, I betcha you can build one with the sand. Same idea.